After spending some time on the blocks in Memphis 10-a-KEY to soak in the Midwest game, Ricky Rozay has another drive by “Elvis Presley Blvd” for his official remix. In the track, he calls up Memphis natives Yo Gotti, Project Pat, Juicy J and Young Dolph to get co-sign and clarity for any cats that were in doubt Rozay had proper roll-out carpet treatment, whenever he’s not in them skreets of the 305. 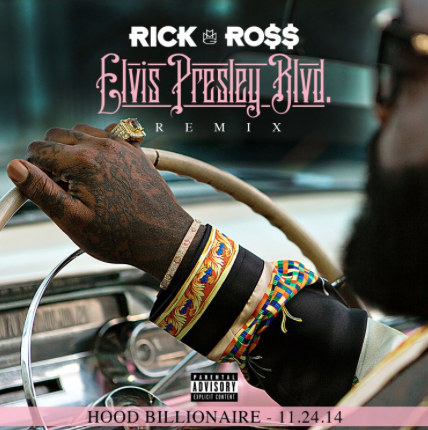 After you listen to his popular DJ Toomp-produced updated effort, look for Hood Billionaire to arriveNovember 24th.